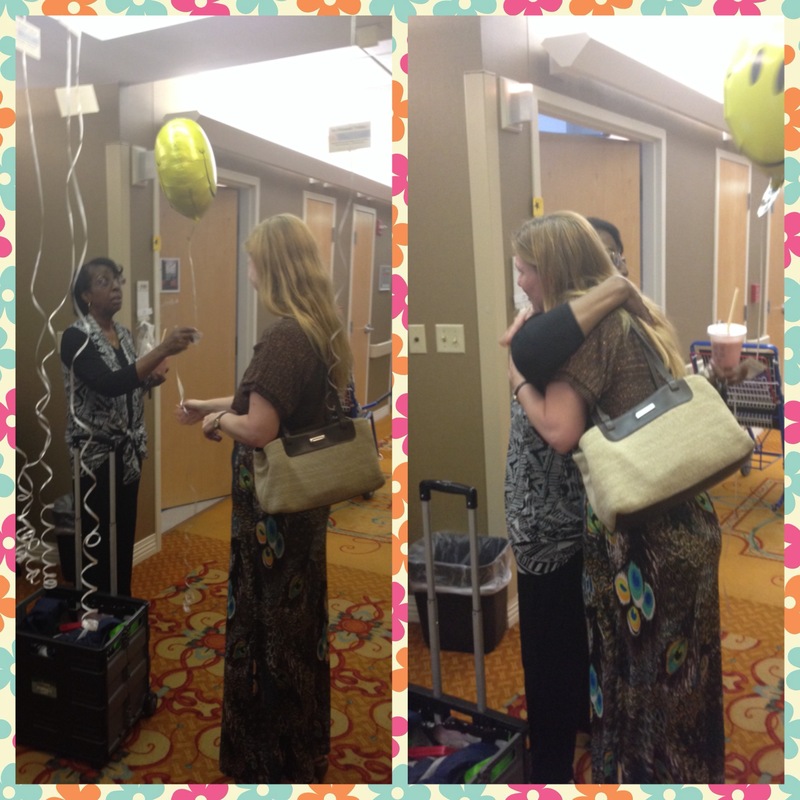 Today I had the opportunity to share in a very special random act of kindness; one not of my own, but of a friend. 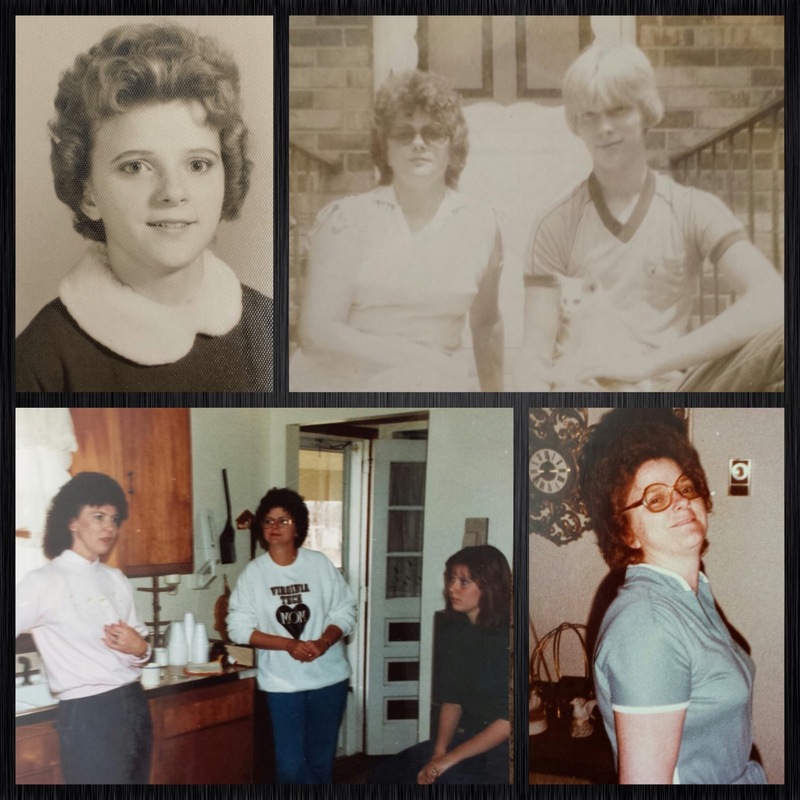 Pam Larson, one of my high school gal pals from two decades ago, reached out to me and asked if I’d like to share in doing something in memory of her mom, Patricia. 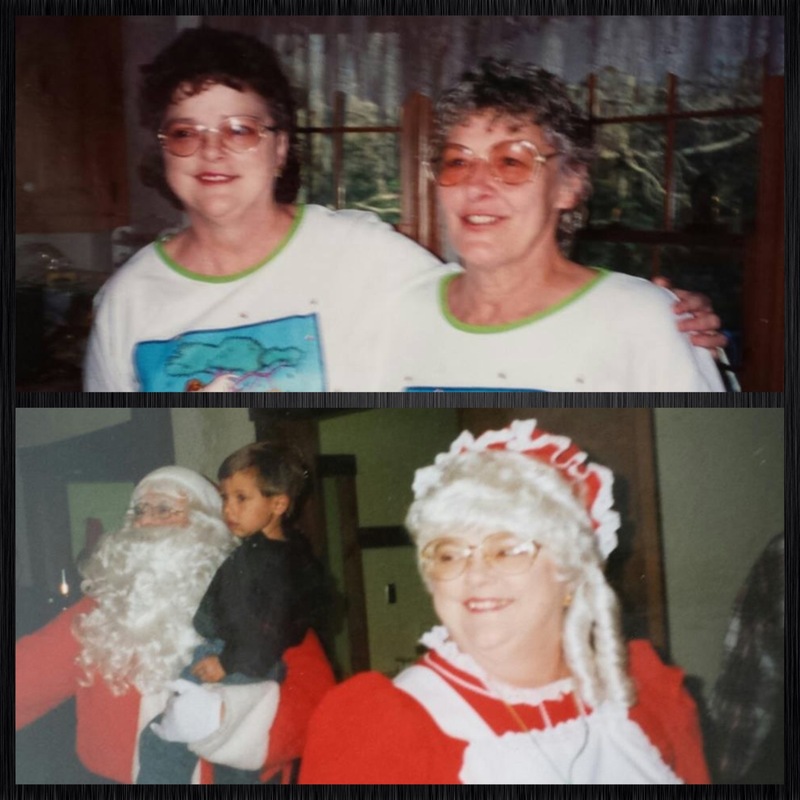 On this date fourteen years ago, Patricia closed the chapter on this life as she passed away from congestive heart failure at the age of 54. 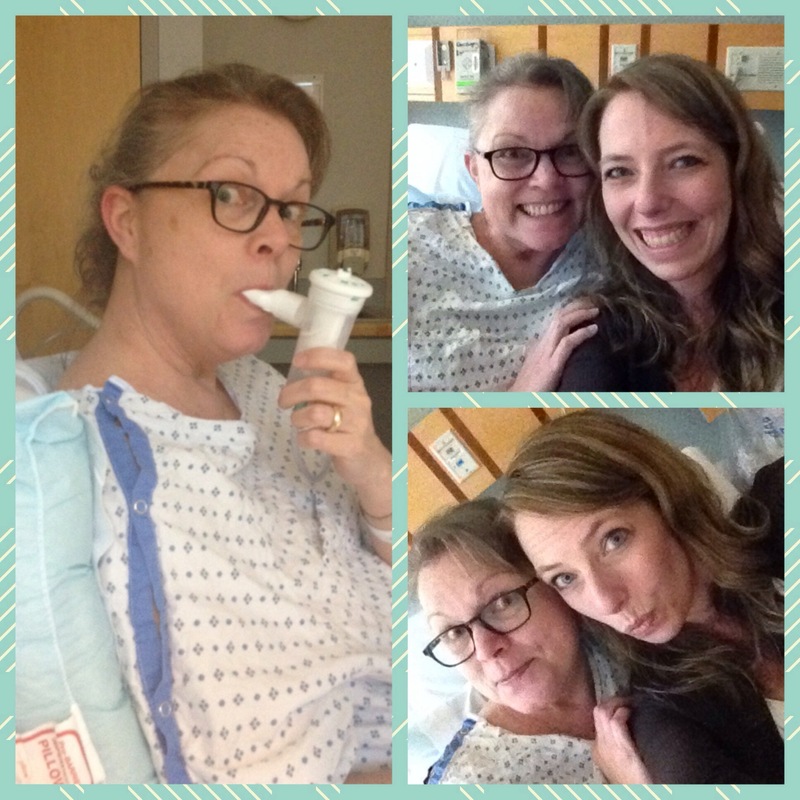 She had many medical issues in the ten years leading up to her death: kidney transplant, quadruple bypass surgery, squamous cell carcinoma in her sinus cavity… not to mention other complications and setbacks along the way. To say Patricia was a fighter, is an understatement. She gave all she had, again and again, just to have as much time as possible with her family. Patricia also spent A LOT of time in the hospital. Her sunny disposition was a bright spot through all the trials. In fact, one of her favorite songs was “Don’t Worry, Be Happy” by Bobby McFerrin, an upbeat song released in 1988, two years prior to Patricia’s kidney transplant. It was in that spirit of celebrating joy instead of sadness that Pam asked me to join her today’s RAK. We brainstormed a bit about what we could do (thankfully, Pam didn’t have 14 inches of hair to cut and donate because that might have ended up with her needing a wig, lol.) 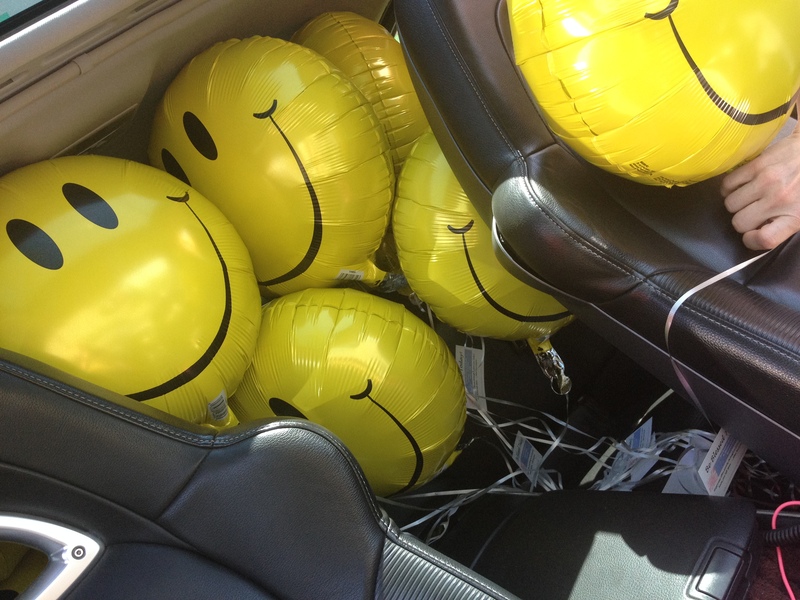 We finally decided that delivering 14 smiley faced balloons to the cardiac unit of the local hospital would be a welcome surprise to bless others and share Pam’s story of honoring her mom’s memory. 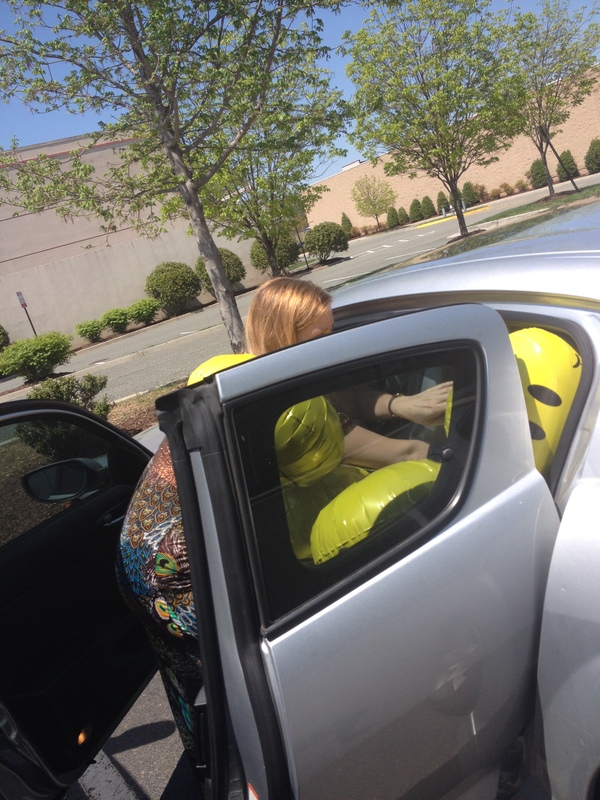 Our first stop was purchasing the balloons. Pam and I were almost giddy watching the store associate blow up each balloon, floating to the ceiling of the store, its long white curling ribbon trailing down to our eager fingertips reaching above. 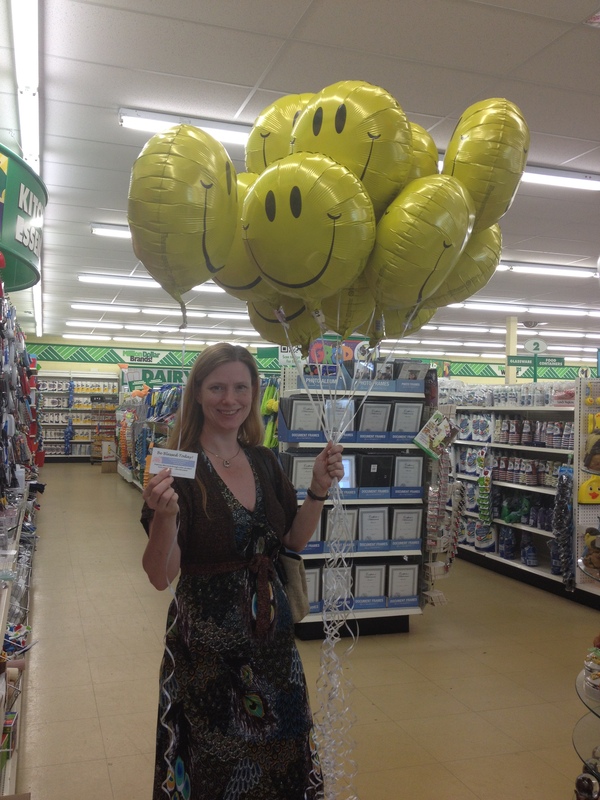 Before leaving the store, we taped a memorial RAK card to each balloon so the recipients would know more about this special RAK. 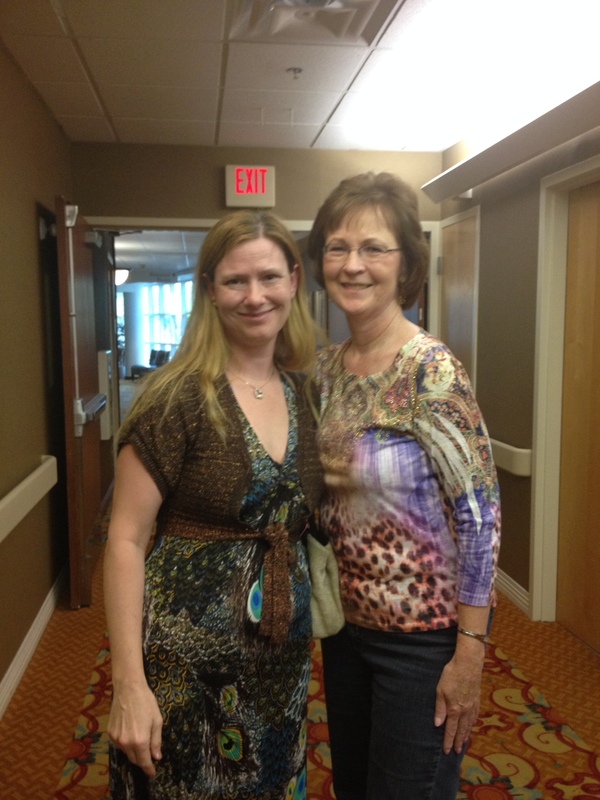 As we headed to the hospital, Pam reflected on various stories about her mom. 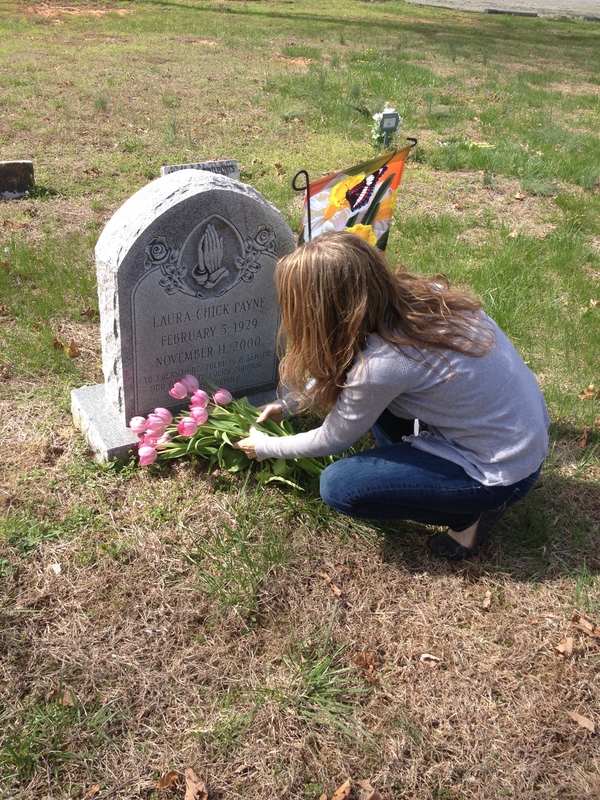 It was a sweet time of remembrance and I knew that her mom would have loved what we were doing in her memory. We arrived at the hospital and walked towards the entrance, the wind whipping the balloons all around us. 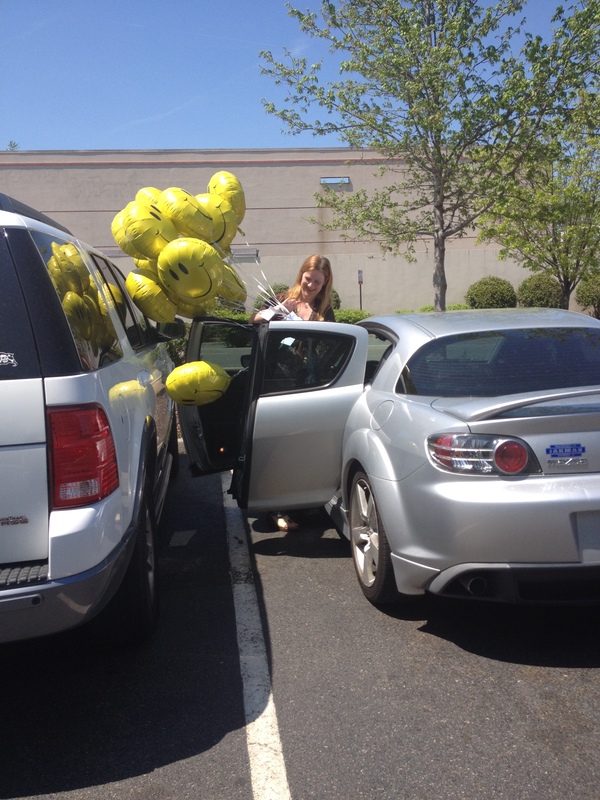 Have you ever had to carry so many balloons at once on a windy day? It is NOT an easy task, let me assure you! We approached the main desk and were directed to the cardiac unit on the second floor. It was time to share some joy with others! The head nurse of the cardiac unit intercepted us almost immediately. “How can I help you?” she asked with quizzical smile. Pam explained our purpose: that her mom had passed away 14 years ago and she wanted to honor her memory by making 14 people smile with an unexpected surprise. 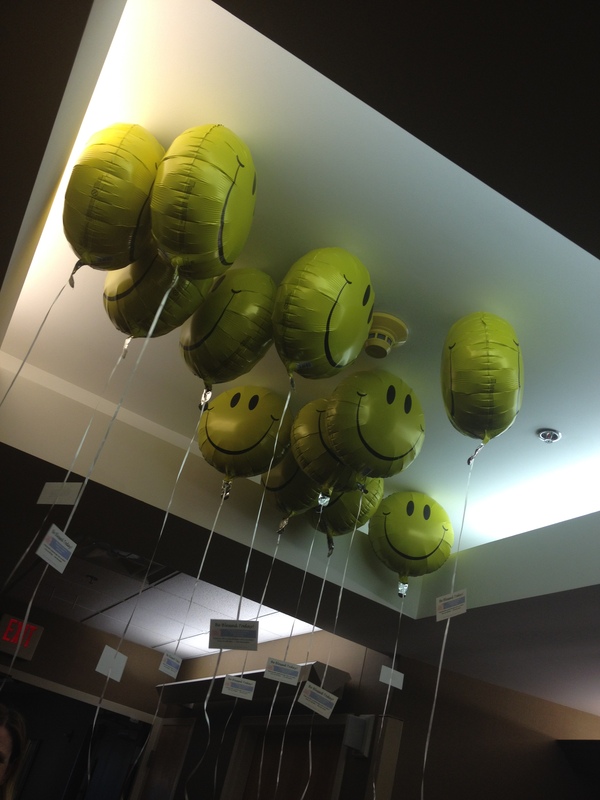 The nurse informed us (after checking with her supervisor) that we would not be allowed to enter the rooms, but she would peek in her patients’ rooms and if they had a visitor, she would ask if the visitor wanted to step out in the hallway to receive a balloon from us. 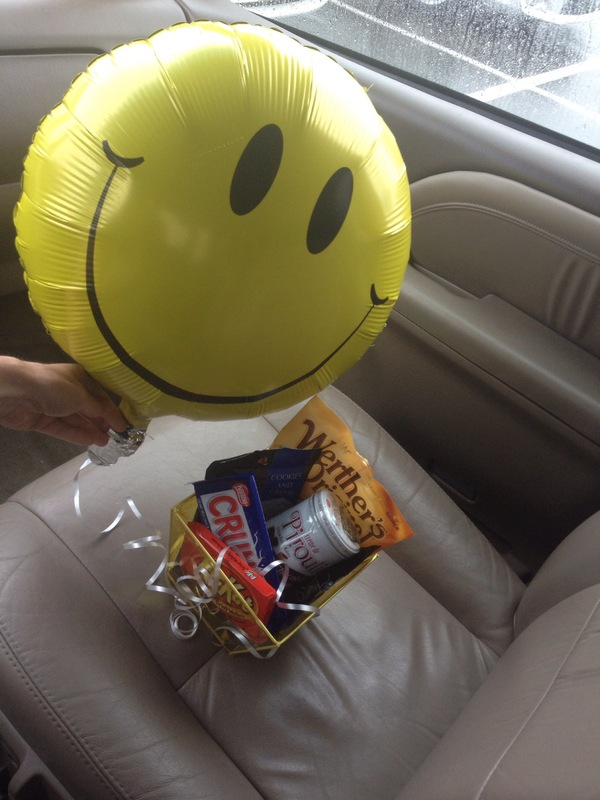 Before she could finish her explanation, one such visitor stepped out of a patient’s room and said, “I would love to bring in a balloon!” Our first RAK! We were thrilled! As we giggled to one another, we realized we had a bit of a quandary… all 14 balloons were in a tangled mess from the wind blowing outside. Although it only took a few minutes to separate a balloon, it felt like an eternity with this hospital visitor standing beside us waiting. Thankfully she was patient (a hospital pun for you medical people out there, lol) and after accepting and delivering our very first balloon, she returned to the hallway to hug Pam and pose for a picture. It wasn’t too long before Pam spotted a visitor walking down the hall. 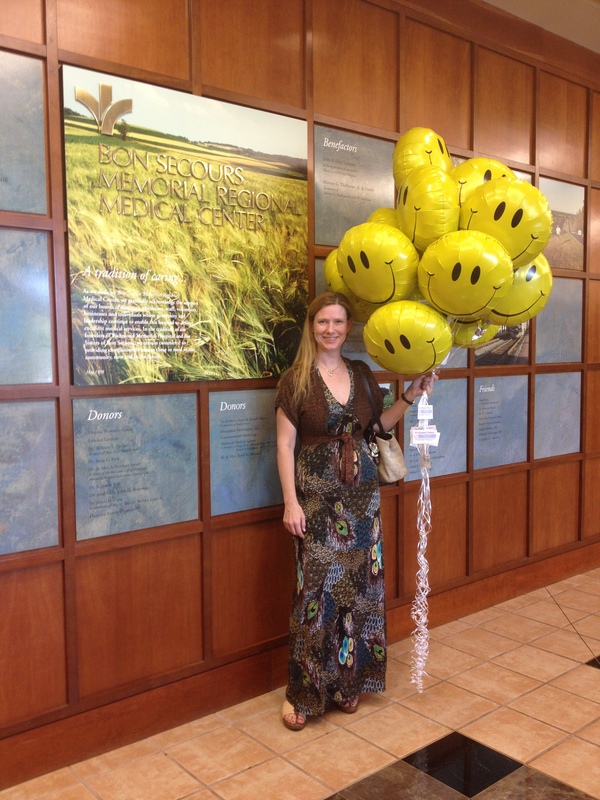 “Excuse me, ma’am, are you visiting someone today?” The lady smiled warily before she responded, “Yeeeeessssss”, then her smile spread across her face as Pam told her about the meaning behind the smiley balloon. This lady stopped. Listened. Hugged. She even added her own thoughts about this experience. “We each have two dates – the day we are born and the day we die. Then we have this line in between. What you do during this line is what matters. This is your purpose. And what you are doing today is part of your purpose.” These words nearly opened the floodgates for sure! There were more hugs. More smiles. 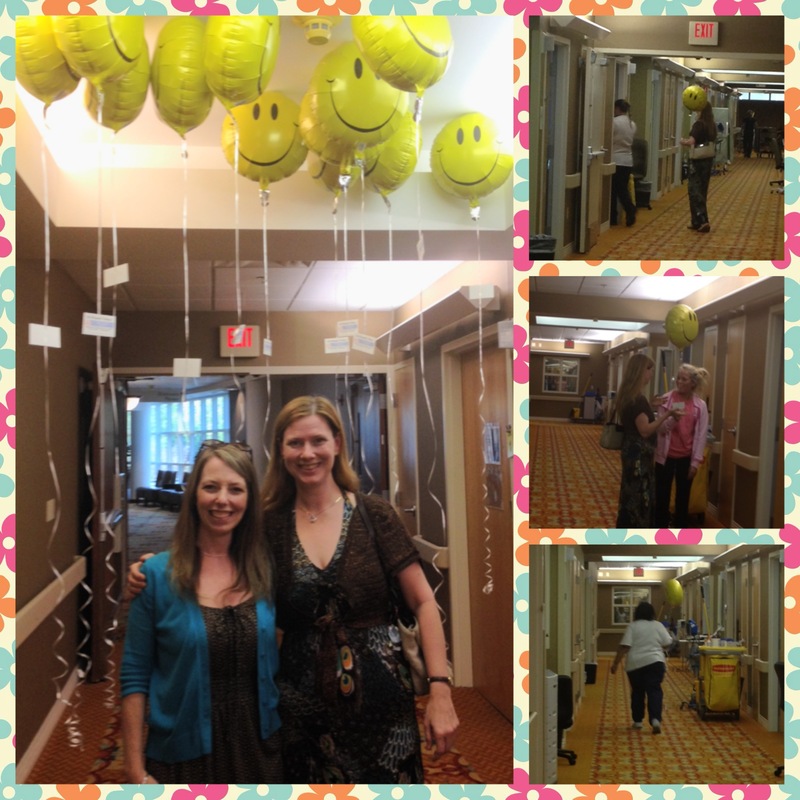 I am convinced that just walking around with a smiley faced balloon in hand can make people happy. We saw so much joy in the eyes of others today! We were also able to share a few balloons with the oncology patients, too – a perfect place to continue our RAK in Patricia’s memory. Be encouraged my friends to share your joy with others, even if it takes you a little bit out of your comfort zone. I promise the rewards will multiply as others pay-it-forward, too! As always, thanks for reading and sharing in my fun-filled RAK adventures! This morning as I was finishing up breakfast, there was a knock at the front door. “Mom – it’s two old ladies coming up the walk.” Sure enough, two impeccably dressed ladies in their best Sunday attire were approaching our house. Freeze frame. What would YOU do in this moment? I’m sure many of you have had this experience before. Maybe not with older ladies in their church clothes holding bibles, but perhaps it was a college student selling magazines or even a young man offering his yard care services. What do you do in the moment? Well, there are many options. You could ignore the knock at the door. You might even hide behind a curtain and peek out, waiting for them to leave. Some of you may have had your patience exasperated by the massive quantity of solicitors in your neighborhood, and you now post a sign by your door saying “NO SOLICITATION.” In any of these examples, you simply don’t open the door. I will admit, I have done all the above. Yes, I’ve even posted a sign by my door. (Do you know HOW many people try to sell you solar screens, solar tint, and water softeners when you live in the Vegas desert?) But in recent years, I’ve come to view these door-to-door solicitors as more than just unwelcome visitors to my private abode. They are simply doing their job. I am very fortunate that my previous experience in sales did not require me to go door-to-door or make cold calls. I have never had to experience the defeat of a slammed door in my face, nor force a smile with an angry stranger. I am blessed! The people who approach my door (which no longer has a sign), are received in kindness. No, I am not a sucker. I never purchase anything from these unannounced visits. But I do believe that my interaction with them has purpose. It provides them an opportunity to practice their sales pitch. It reminds them that there are nice people in this world. Sometimes, I believe they leave my house happier than when they arrive, simply because they weren’t exposed to hatred. Now I’m not going into a big debate about “if they don’t like the responses, they should choose another job.” That’s neither here nor there. The bottom line is simple: they ARE doing their job. I feel compelled to respond the only way I can – with love and kindness. Which brings me back to the knock at my door. I opened the door and stepped onto my front porch, reflecting the smiles of these new visitors. The next few minutes I listened. Smiled. Nodded. I made eye contact with each lady and allowed them the opportunity to share their information without interruption or discourse. When there was a natural pause in the conversation, I responded with gentleness when I said, “Ladies, I appreciate the time you have spent with me this morning. I feel very secure in my beliefs, so I probably won’t be changing my views anytime soon. But I am thankful that you have such a beautiful day to share your thoughts with others.” I continued to smile as I shook both their hands, thanking them for their visit. 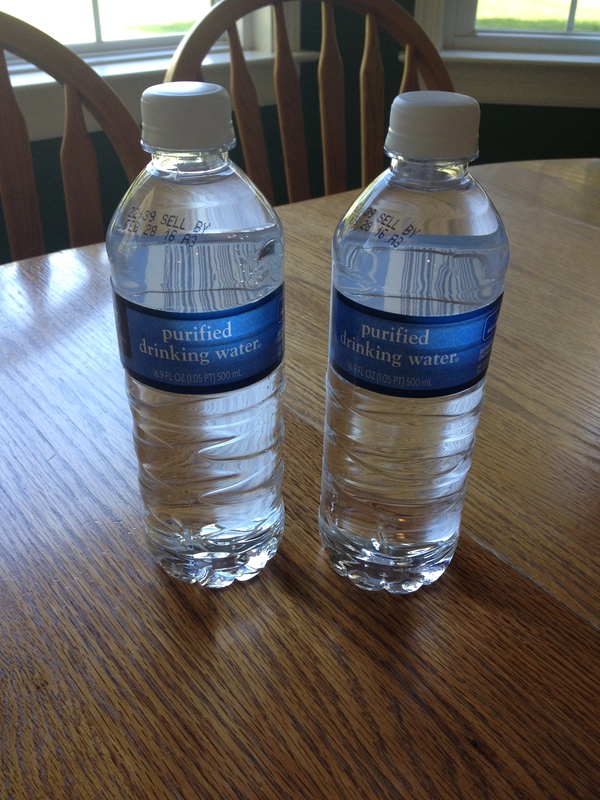 Why did I offer them water? Because I knew the temperature today is expected to reach the 80’s and these ladies were dressed from head to toe with clothing. Surely they would get hot making visits all day long! Seemed like a pretty simple gesture of kindness, but you could tell by their reactions they were not used to such an offer. Although they declined the water, they left my porch with smiles and sweet chatter. It was then that I realized I was still smiling, too. Be blessed my friends. Even if you choose to hide behind the curtain at that knock on the door, that’s better than spewing out anger and hatred. Maybe today you will take a moment to listen to someone else who seeks your attention. Might be your children; might be a stranger at the grocery store. Take the time to let someone else know you appreciate them. It could make a world of difference for you both! Did you do anything nice for someone today? 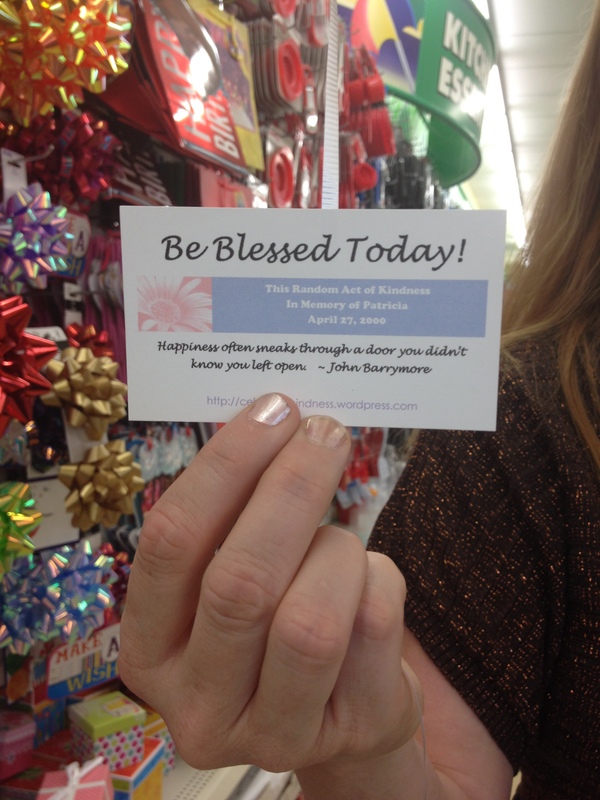 Maybe you held open the door for a stranger or perhaps you gave someone a compliment to brighten their day. Those count, too! No act of kindness is ever too small – you never know the impact your kind deed may have on someone else’s life! To celebrate International Pay-It-Forward Day, I did a simple RAK at my school. 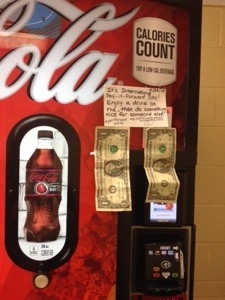 I taped a few dollars to the drink machine in our teacher’s lounge with a note for the recipient to pay it forward by doing something nice for someone else. That’s it! Quick and easy! RAKs don’t have to be these elaborate, expensive moments of generosity (although they are REALLY fun to read about, lol!). Just sharing kindness from one person to another is enough. You may have done several RAKs today and didn’t even realize it, because you are such a nice person EVERY day! How great! Give yourself a pat on the back for spreading a little more joy in this crazy world. You ROCK! Such words of wisdom. It took everything in my power not to interject with advice from a girl’s perspective. I simply chuckled to myself and made a mental note to share a conversation with my son before he asked a girl out on their first date, scouring the bins of Michael’s craft store for the most beautiful fake flowers money could buy, lol. His comments did resonate in my brain, however, and gave me pause to think. What is it about live flowers that have such a great appeal versus fake flowers? Is it their brilliance in color that cannot be replicated? Or maybe it’s their temporary presence, blooming only for a short time, reminding us all to enjoy beauty while it lasts. I believe it’s a little of both. Artificial flowers, while pretty and everlasting, can’t quite compare to the real deal. Today was a beautiful day for a drive. Leaving the city behind and traveling where the green hills roll and white fences stand was blissful even in itself. Two dozen fresh tulips sat in the floorboard of my car, their subtle magenta petals starting to spread. A folded garden flag detailing daffodils and butterflies accompanied me on my journey along with a small bunny figurine. The drive was long, but peaceful, as all country drives should be. Within the hour, I arrived at my destination to deliver my flowers and gifts. The ground was soft as I made my way from gravel to grass. 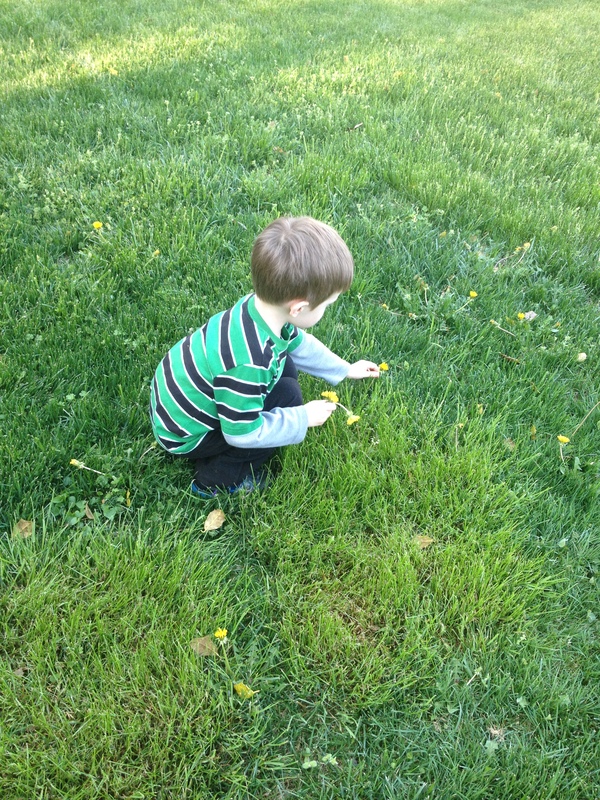 I could hear the birds chirping in the trees as they announced their pleasure at the return of spring. The sky was a flawless blue, not a cloud to be seen, and the sun’s rays streamed down, warming me as I walked the short path to visit with my Grandma. Now I could spend the next five hours telling you stories about my Grandma, about our family plot in this cemetery, about how she battled ovarian cancer for 6 years, about her unselfish love for me and all those she knew. But this RAK wasn’t just about bringing flowers to my grandma and tidying up her grave. This RAK was actually about Shelby Ann. 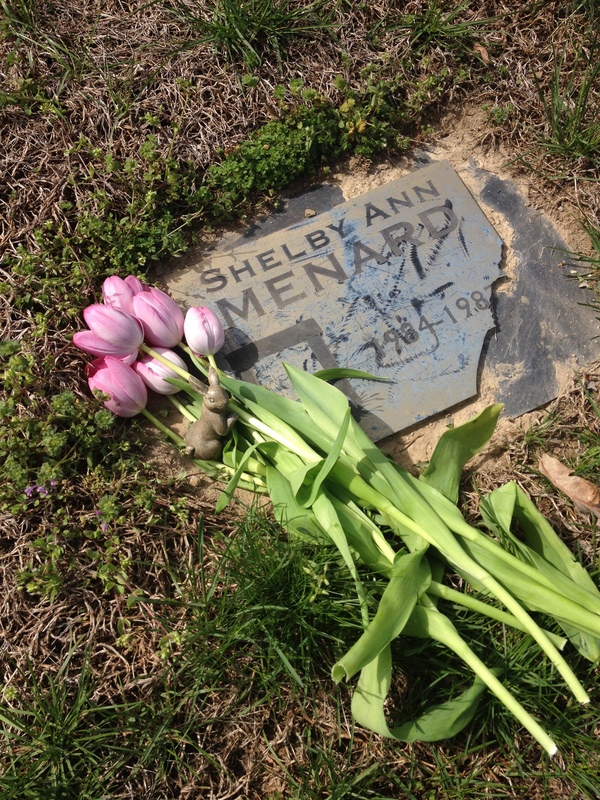 And so began the tradition of bringing Shelby Ann flowers, too. Years and years of flowers have been brought to Shelby Ann, sometimes they remain and sometimes they do not. We have never met her family during our visits, and for more than a decade her death was marked by nothing more than the initial marker provided by the funeral home. We were surprised on one of our visits to discover her sweet name engraved on a plaque, shiny and new. She was loved! Oh, how wonderful! That joy was turned to sorrow when another visit revealed the corner of the plaque broken and chipped, apparently the unintentional victim of a lawn mower. 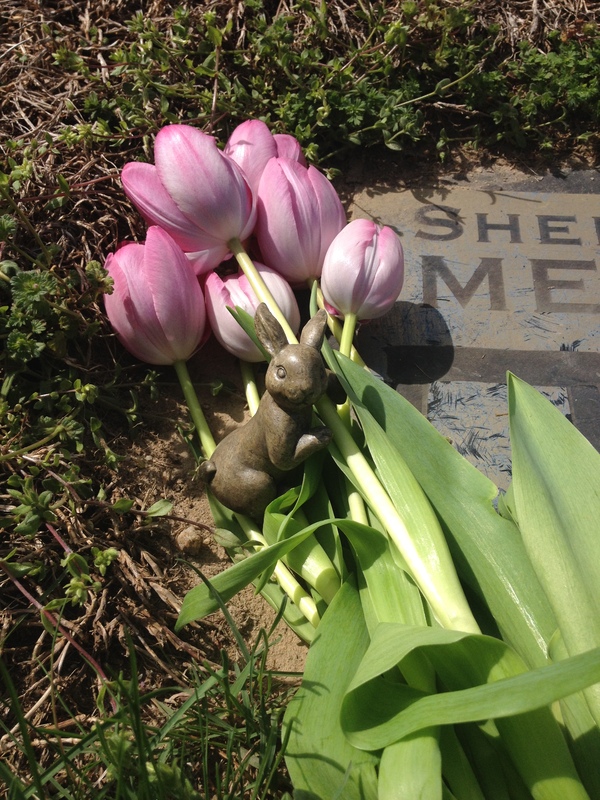 Have you ever wondered about the stories that a simple headstone can hold? We live. We die. How many stories are lost with that final departure? Who is left to tell Shelby Ann’s story? Who will be left to tell mine or yours? Weighty questions best saved for another day. Today, for my 100th RAK, I brought flowers to my Grandma and a girl I never even knew. And despite my son’s wonderful advice, I went with real instead of fake. As we enter the Easter season, reflecting on the sacrifice Jesus made for us, think for a moment about a sacrifice you could make for someone else. Is there something you could do for another? Jesus paid the ultimate sacrifice, dying on a cross, and no one can ever come close to that. But you know what? You can still give of yourself. Your time. Your compassion. You really can be the change you hear people talk about. Even if the only “change” you do is bring flowers to someone’s grave. Be blessed my friends and thank you again for sharing in my journey. Here’s to the next 100 RAKs! Cheers! Last weekend I had my hair “done” (a.k.a. cut and highlighted) and let me tell you, to say I due for a haircut was an understatement. It had been 4 months since I sat in Hayley’s chair (!!! ), and despite my guilt over letting so much time lag between haircuts, she just smiled and said, “It’s so great to see you again!” As we were chatting, she casually mentioned that her birthday was coming up and then we talked about our kids, our life events, and yes, even the weather. Just your normal visit to the hair salon, right? After my hair had been trimmed and selectively painted in shades of auburn and honey blonde, I sat to the side with my head full of foil waiting for the colors to magically transform my hair. Hayley started chatting with a new client in her chair as I absent-mindedly thumbed through a magazine, watching the clock. Before too long, it was time to remove the foil and rinse out my freshly updated locks, but Hayley realized she would need some assistance as she was still working on the new client’s haircut. 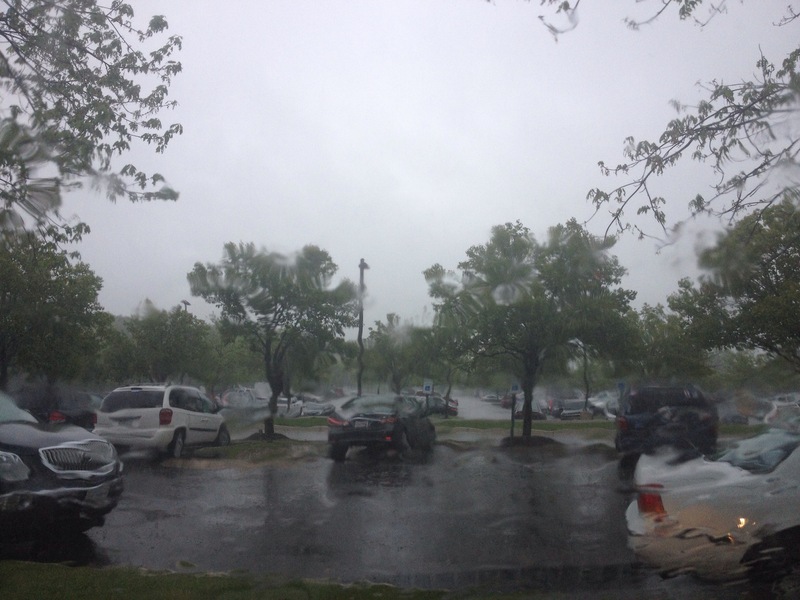 “I’m going to let Chelsea rinse you, if that’s OK,” to which I smiled and nodded my approval. Now I have to stop my story right here, because if you are one of those barber shop patrons, what I am about to write will seem completely absurd. When you go to a barber shop, you are there for one thing only: Cut. My. Hair. The. End. However, when you visit a beauty salon… well, it’s no big secret that their job goes above and beyond JUST a haircut. Their mission is BEAUTY – inside and out! So here I am, lying on something that looks like a very primitive Lazy-Boy with the back of my head hanging over the ledge of a sink, with my long hair all crumpled up in foil, feet up, a cross between a breathing corpse and a female Frankenstein (sorry, that’s about the best analogy I can think of to describe the scenario, lol.) I close my eyes and grit my teeth, because I just know at some point in the process of pulling out all that foil, my hair is going to be yanked. And then… without warning, I heard the sound of running water and the crisp crackle of foil being thrown in the trash. Wait. She’s already DONE? No yanking or pulling? No grasping or cringing? REALLY? What a delightful surprise! As Chelsea rinsed the chemicals from my hair and applied shampoo, I started to relax, not even realizing how tense my shoulders were with anticipation of the foil removal. I felt Chelsea’s fingers massaging the back of my head and allowed myself to simply lose myself in the moment of the BEST. HEAD. MASSAGE. EVER. By the time she was done, I felt like I had lost 10 pounds and found the prettiest prom dress in town. I felt amazing! I returned to Hayley’s chair where she dried and straighten my long hair, then turned me around to see the final result. As always, I was estatic – how is it possible for a woman to transform from an ugly duckling to a beautiful princess with just one cut and color? OK, OK, so maybe I wasn’t quite “princess” material, but I sure did feel pretty in the moment – all thanks to my hair stylist and shampoo girl! So today I decided to give back with small surprises for the two gals who brightened my day. Remember me mentioning Hayley’s birthday? Well, today is the day! 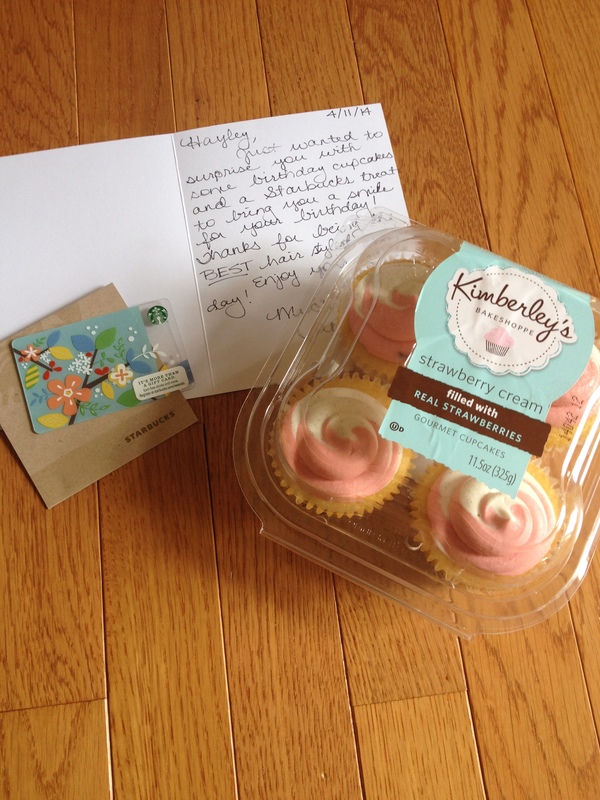 I went to Kroger and picked up a few cupcakes, then wrote her a card thanking her for being the best hair stylist ever. 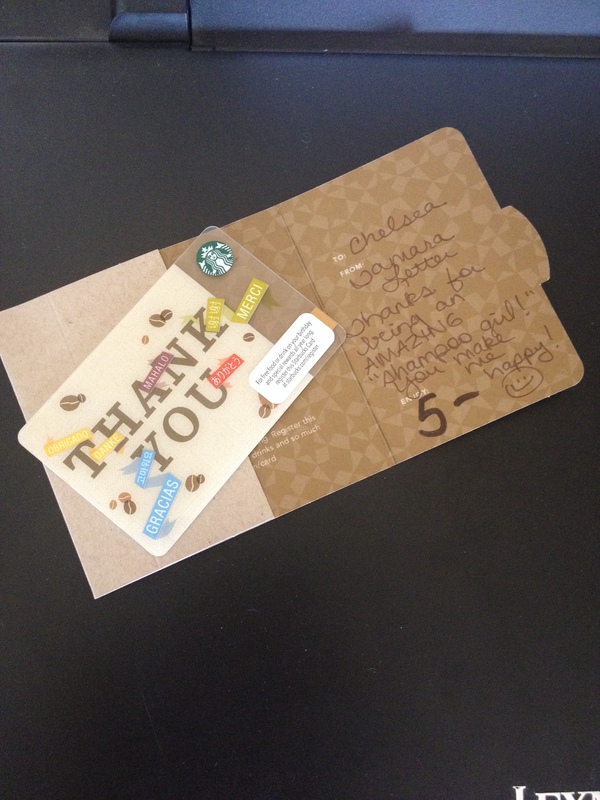 I also included a Starbuck’s gift card (one for each gal) as a simple “You are Special!” treat. This weekend, think about the guy or gal who makes you look and feel great. 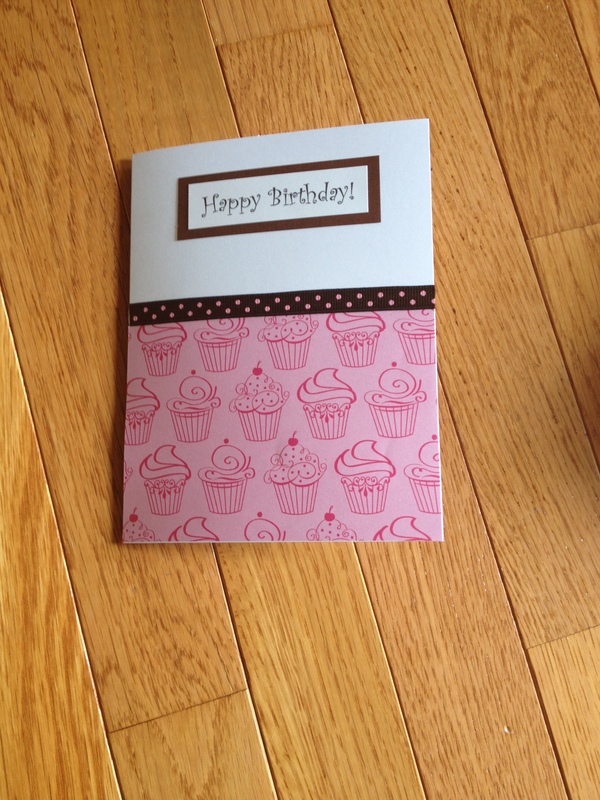 Take a moment to give back and write them a note of appreciation or surprise them with a small treat. You might even think about surprising a hair stylist you don’t know – just for the purpose of saying “thanks for all you do.” It doesn’t take much to show appreciation, but the rewards multiply exponentially! 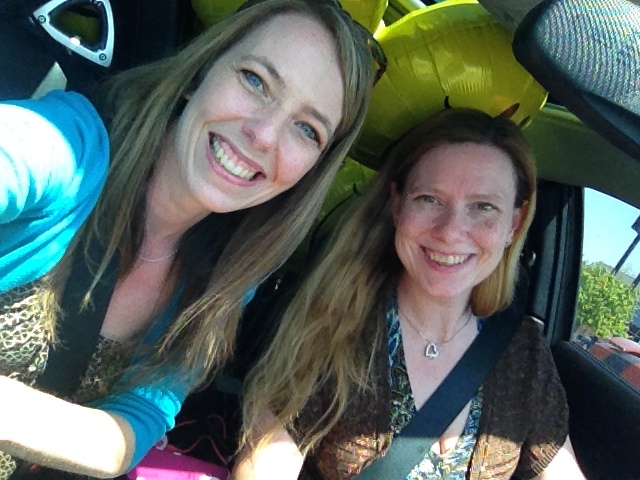 Be inspired and thanks for sharing in my adventures! 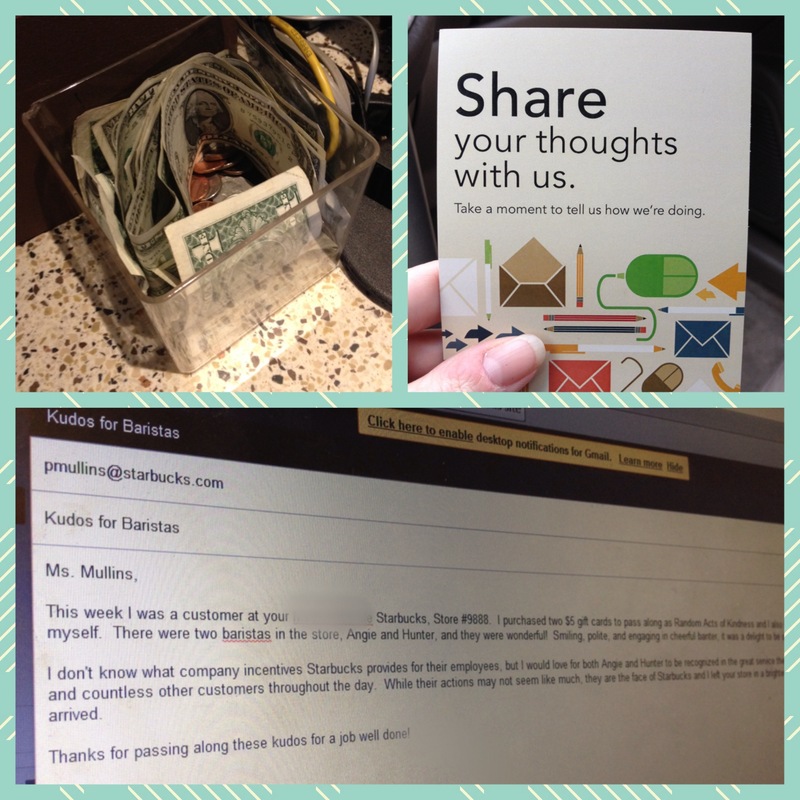 As I was leaving the store, a small pamphlet caught my eye titled, “Share your thoughts with us.” Now I’m sure you’ve seen similar comment cards in businesses you frequent, but for whatever reason, it occurred to me that I rarely take the time to share my thoughts with a business. Good experience or bad, I tend to continue about my way without a second thought. Today was different. 🙂 What better way to show my appreciation for great customer service than letting their boss know? So I took the pamphlet and wrote an email to the District Manager. I also left a few extra dollars in their tip jar, too! 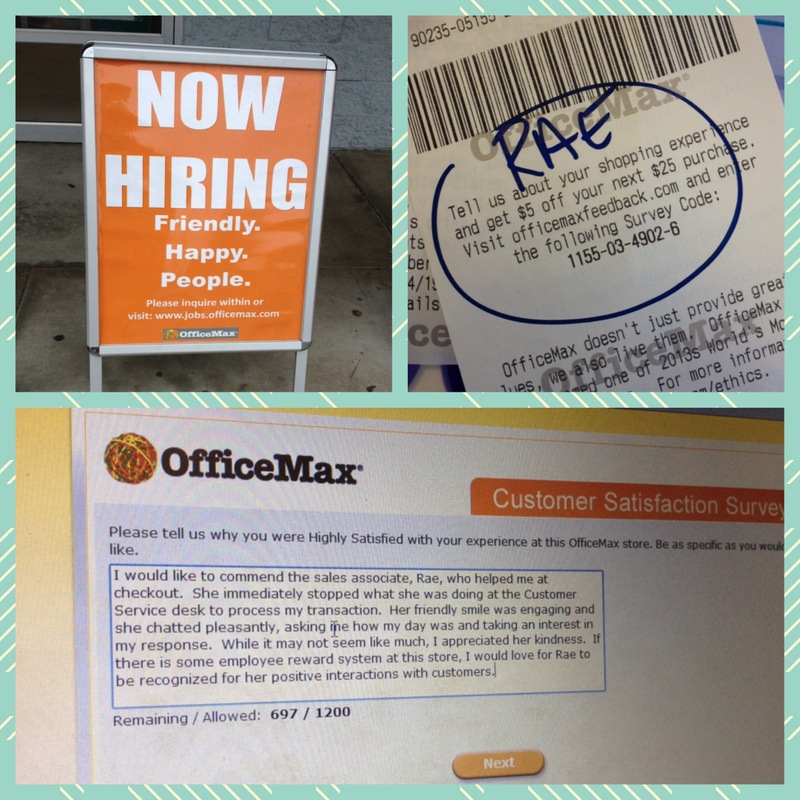 My next stop was OfficeMax and I had to laugh at the sign outside their door: “Now Hiring. Friendly. Happy. People.” It made me chuckle at the placement of the periods, emphasizing each word individually. My visit there was quick, I only had one item to buy, and as I made my way to the checkout, there was no one in sight. Obviously there’s not a mad rush of people buying office supplies at 4:30 in the afternoon, lol. I walked towards Customer Service and the lady working there caught my eye. A survey to complete. How many times have I heard THAT phrase? Seems like everywhere you go, someone wants information from you. How do you like this, how do you like that. If I was a pessimistic person, I might have crumpled the receipt in my pocket, refusing to share any information at all. But thankfully, I’m a Pollyanna. 🙂 Despite never having completed a survey before, I took the time to complete it today. I was thrilled to have an open text box where I could compliment Ms. Rae on her great customer service, too! Was this random act of kindness difficult to complete? Nah, not a bit. Did it cost any money? None at all! (Excluding the money I already spent on my purchases, lol.) Did it take time? Yes, but less than five minutes. I spend more time trying to shut down my computer and place it in my laptop bag than I did completing both of these RAKs. So in that regards, it really didn’t take much time at all! I hope you will look around you as you complete your errands this week/weekend and take the time to say “thanks” to those in the retail industry who work tirelessly to make our transactions a pleasant experience. It may not seem like a big deal to many, but those employees have been smiling ALL day long… it’s the least we can do to give them a reason to keep on smiling! Be blessed my friends and pay it forward!